This week I worked on some big weeding projects. It seems silly to weed our huge prairies by hand, but I haven’t found any other ways to get rid of some of the most troublesome weeds. 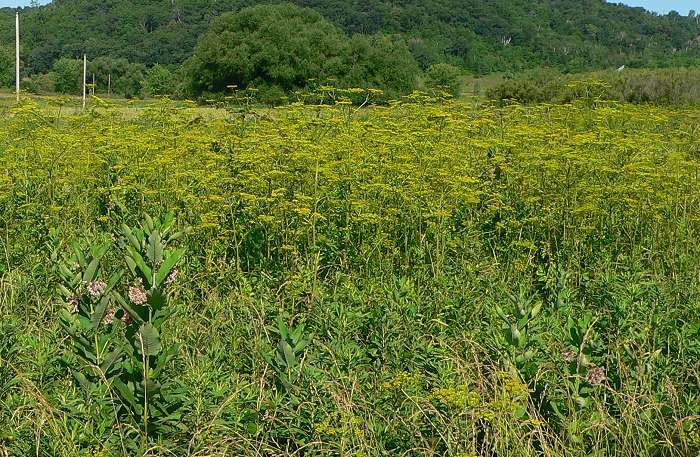 Wild Parsnip (Pastinaca sativa) is an exotic, very aggressive weed that’s invading our wetland. It came originally from Europe and Asia, and was found in Wisconsin as early as the late 1800s. 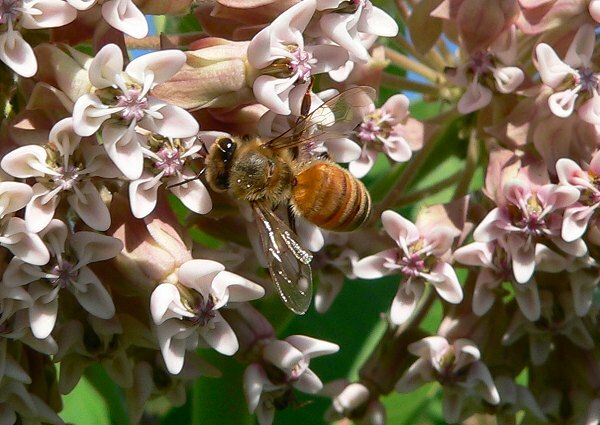 It’s been spreading rapidly in recent years and is now found in every county in Wisconsin. One of the problems it causes is phytophotodermatitis, which means that contact with the juice of the plant and then exposure to sunlight causes painful blisters on exposed skin. Unfortunately, we have a lot of it. 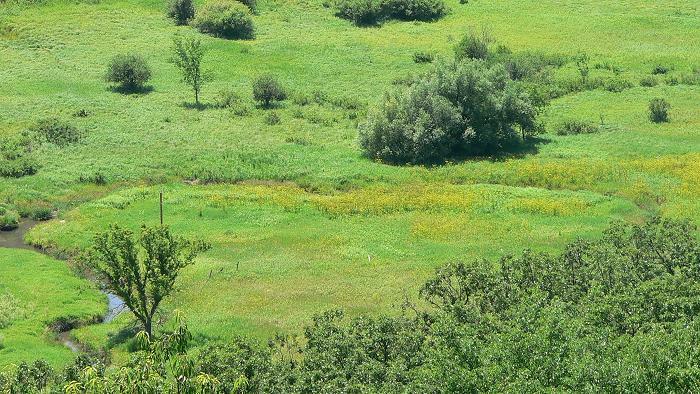 This is a view of a part of our wetland from above. All the yellow flowers are Wild Parsnip. We’ve tried various methods of controlling it, but the most effective are hand weeding (while wearing protective clothing) or hand removal of the seeds. At this time of the year I pull as many of the plants as I can, especially in areas of the wetland that have mostly natives, or where I’m trying to get natives established. Here’s an area in the wetland with many natives, but it’s been invaded by Wild Parsnip. This is the same area later in the day, after I’ve weeded out the big clump of Wild Parsnip. Here’s the pulled Parsnip headed to the compost pile. 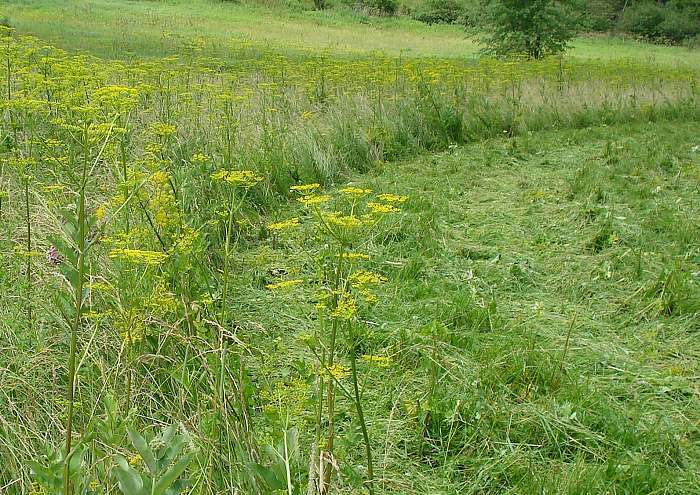 Mike has been trying to keep the Wild Parsnip under control in a larger area where we plan to spray and plant natives next year. He mowed it last week, and he’ll have to mow again in a few weeks, otherwise the Parsnip will resprout and produce new flowers. We sprayed a large area in the wetland last year to get rid of Wild Parsnip and non-native grasses. 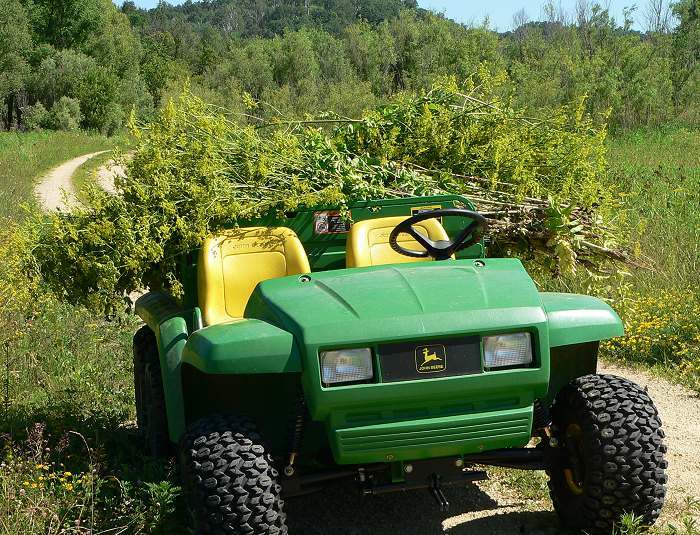 Our plan was to spray it again this year, and plant wetland seeds there this winter. 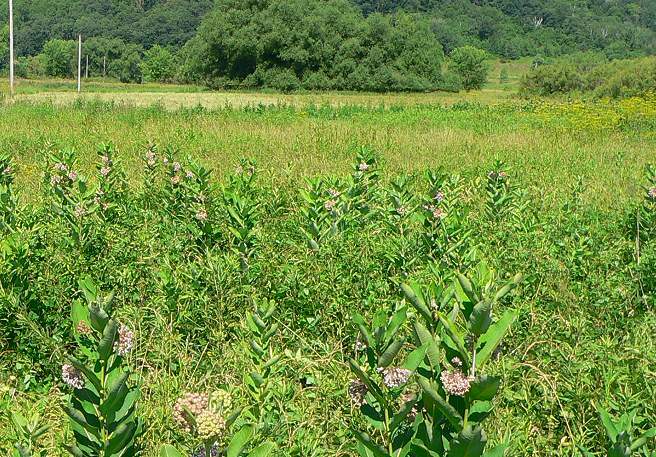 I checked on it this week and the whole area has grown up in natives – mostly milkweeds. I also saw Blue Vervain (Verbena hastata), and Water Horehound (Lycopus americanus). There are patches of first year Parsnip, but I think I can eliminate them with spot spraying and pulling. 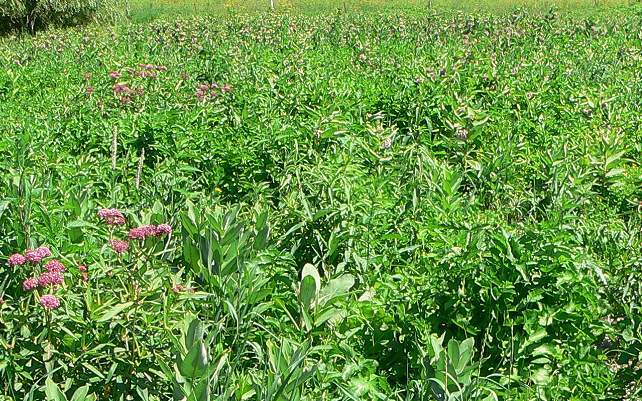 Thick growth of Common Milkweed (Asclepias syriaca). 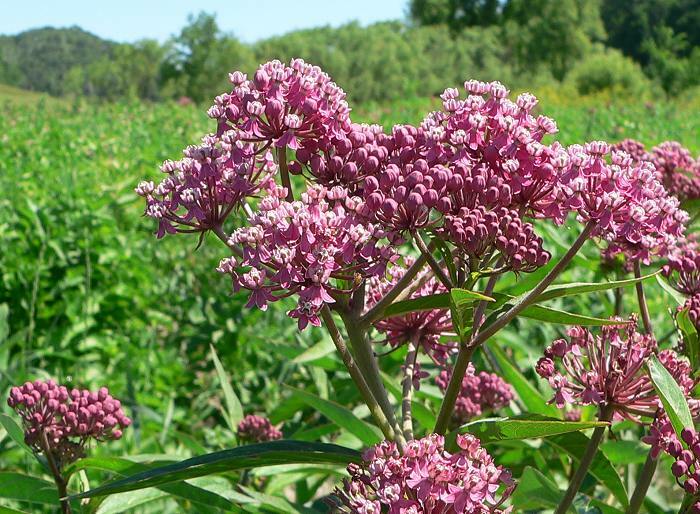 Here’s some Swamp Milkweed (Asclepias incarnata). 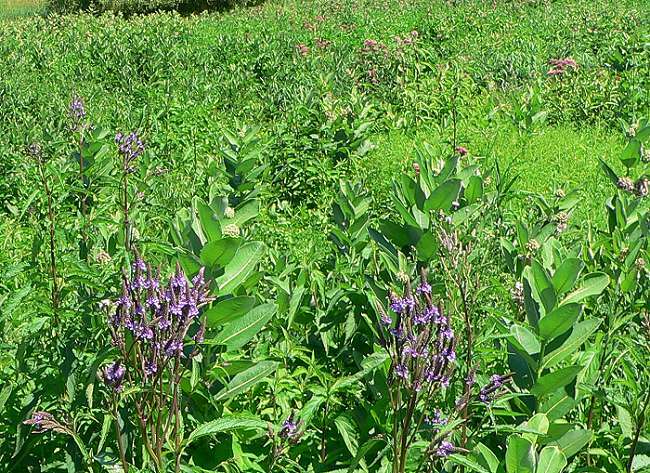 Some Blue Vervain with the Milkweeds. 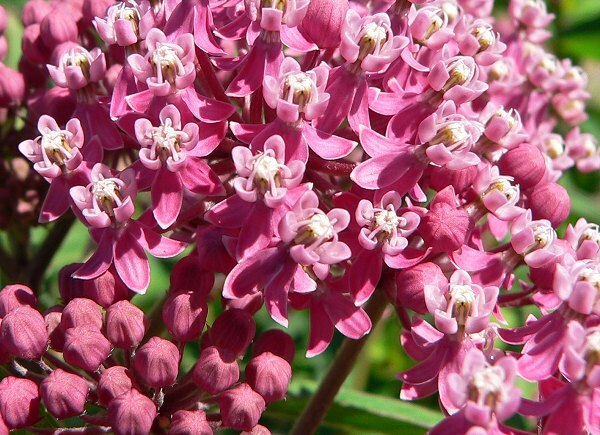 There were dozens of insects and several hummingbirds nectaring on the milkweed blossoms. The second big weeding project is Common Mullein (Verbascum thapsus). Mullein is another exotic weed that was brought from Europe in the 1700s as a medicinal plant. 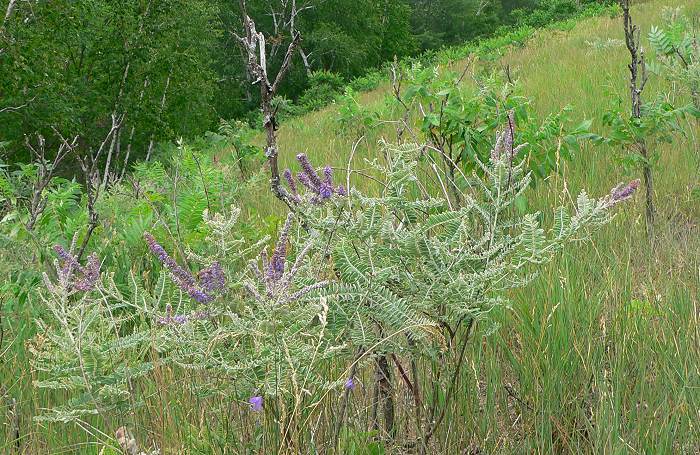 It’s common in fields and roadsides all over Wisconsin. It’s a biennial, so it makes a rosette of gray fuzzy leaves the first year, and sends up a tall flower stalk the second year. A few mullein plants aren’t too much of a problem, but in some of our new prairies we have hundreds of plants. They make the prairies look like deserts with saguaro cactus. Today I spent a couple hours clipping and removing the flowering stalks, and spraying the cut stems with roundup. I’m hoping that will prevent the stalks from flowering again. Mid-summer flowers are blooming in the prairies now. 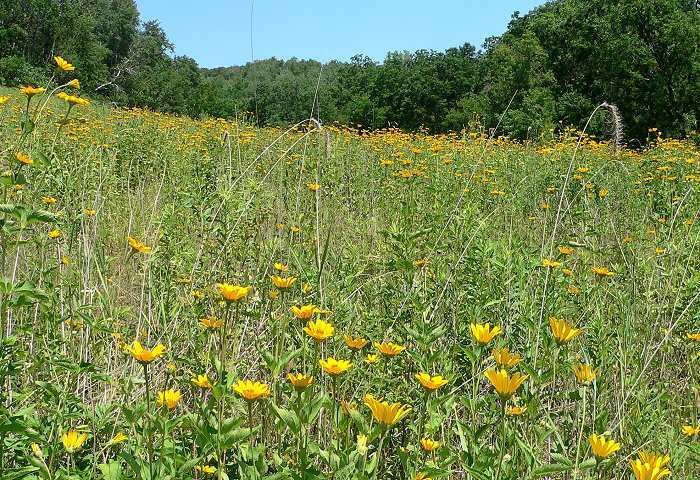 This is Oxeye (Heliopsis helianthoides) in 3 Finger Valley. 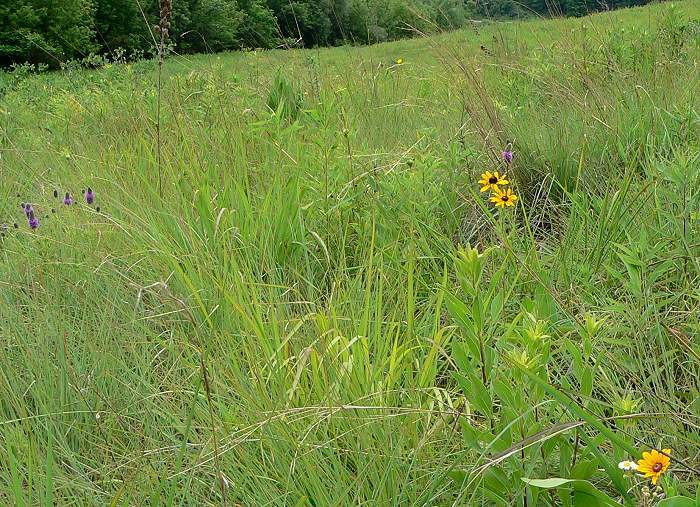 Here’s the south end of Western Prairie – its second year as a prairie. 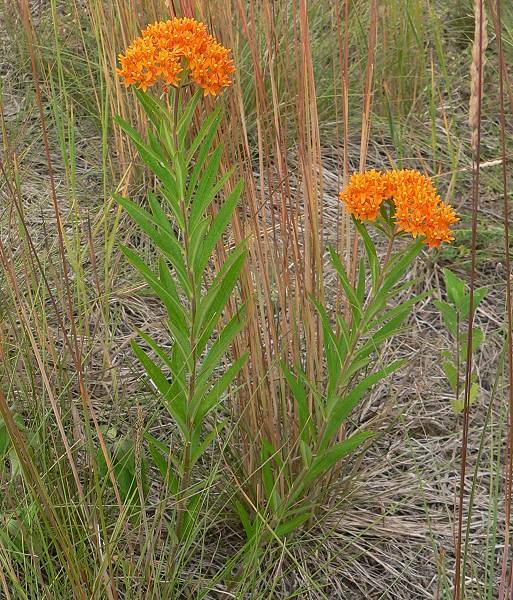 I found Butterfly Weed (Asclepias tuberosa)blooming in Buffalo Ridge Prairie. 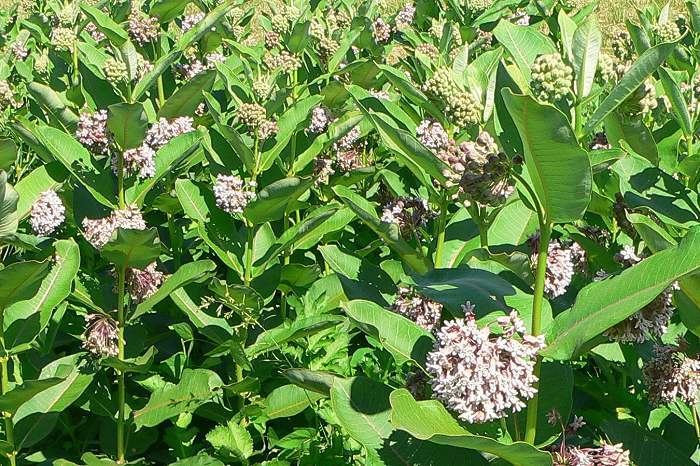 This is another plant that I plant in all the prairies, but don’t find growing very often. I think it’s particular about the kind of soil it will grow in. 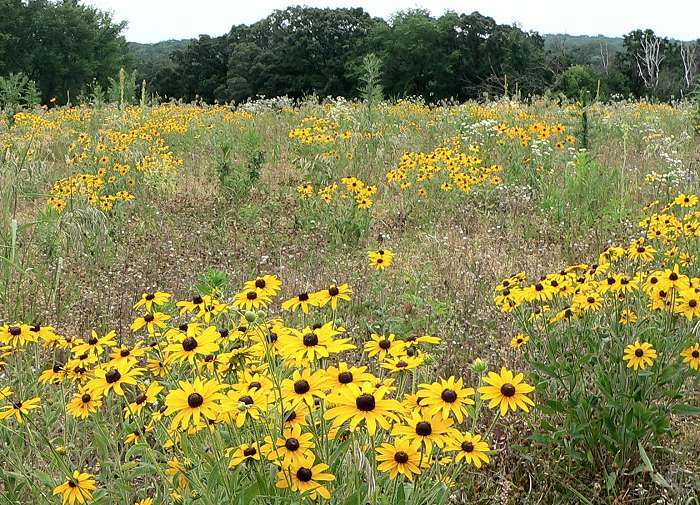 This is a view of West Center Valley Prairie. 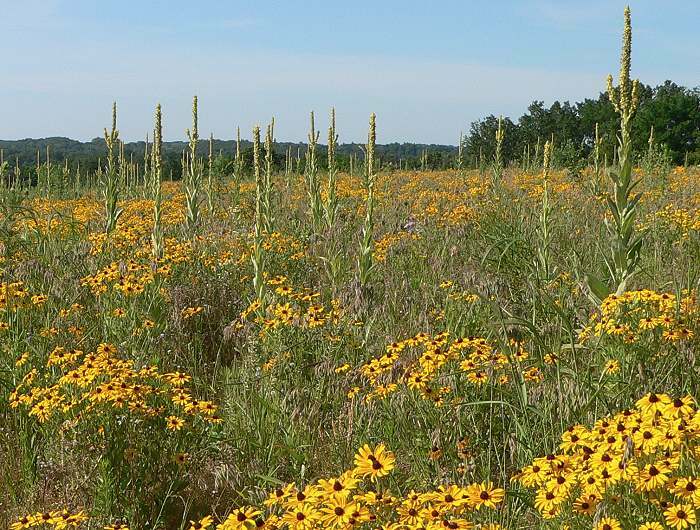 This is its 7th summer, and it’s turning into an interesting, diverse prairie. 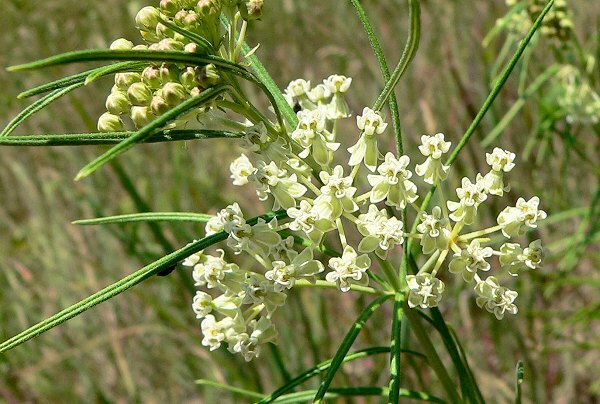 Whorled Milkweed (Asclepias verticillata) is blooming in several of the prairies. 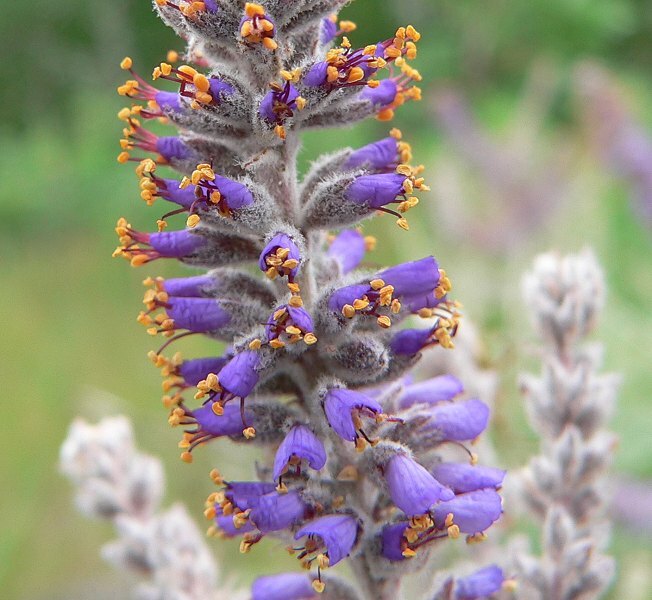 Leadplant (Amorpha canescens) is doing very well this year – it must like drought. 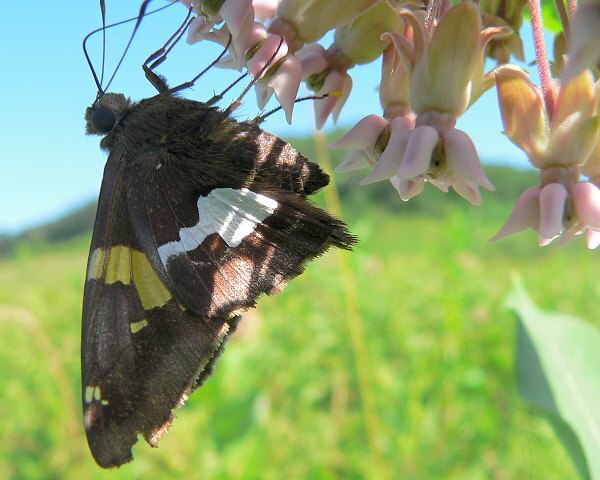 This one is on Big View Prairie. 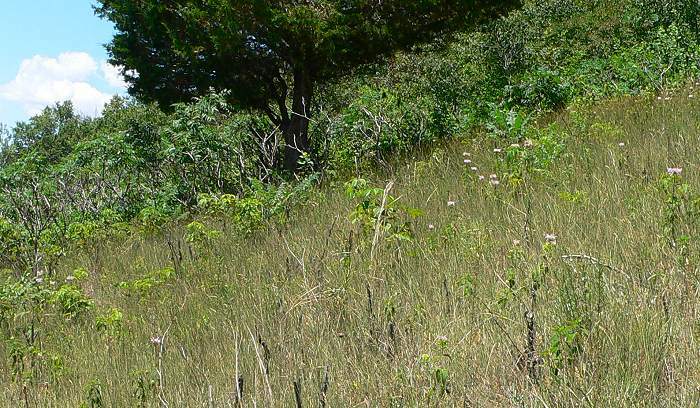 This is the area we cleared of Sumac on Sumac Prairie last fall. It’s still doing well – not much sumac coming back and some prairie plants are blooming. 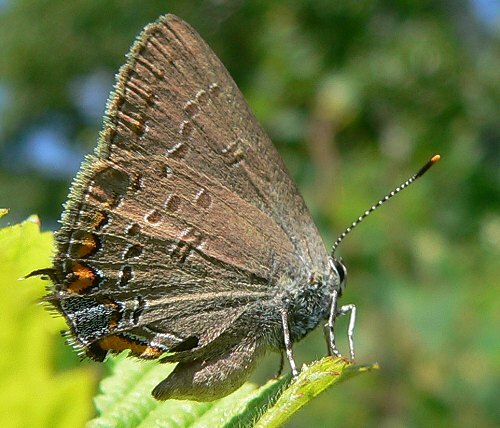 Here’s an Edwards’ Hairstreak on Sumac Prairie. 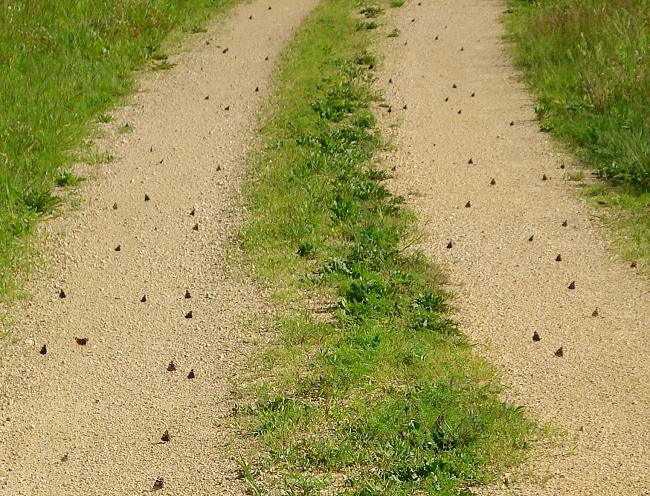 The driveway is still covered with butterflies. 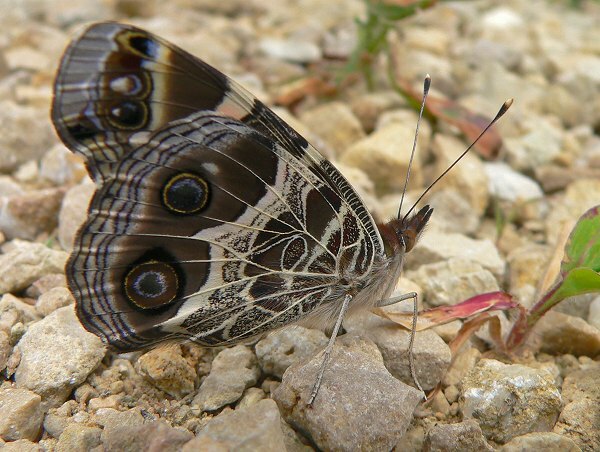 It’s difficult to get a good picture – they fly up when we get close. When we walk they fly around us in a cloud. Mike finally did get a good photo. 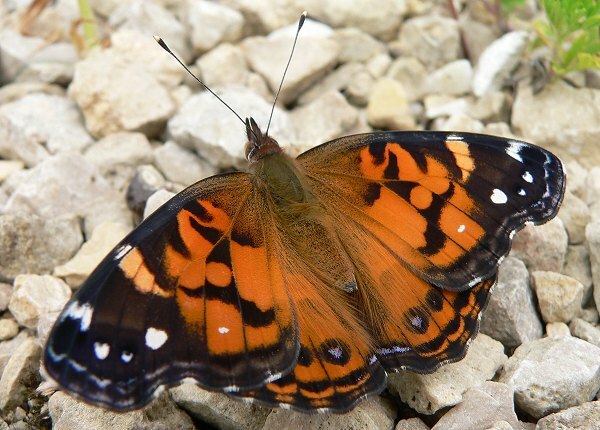 My American Painted Lady butterflies have all hatched now, and I released them. 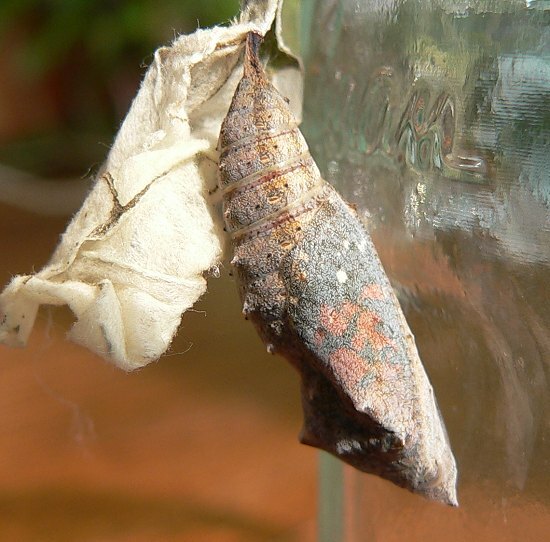 Here’s one of the chrysalises just before the butterfly emerged – you can see the butterfly’s wings inside. 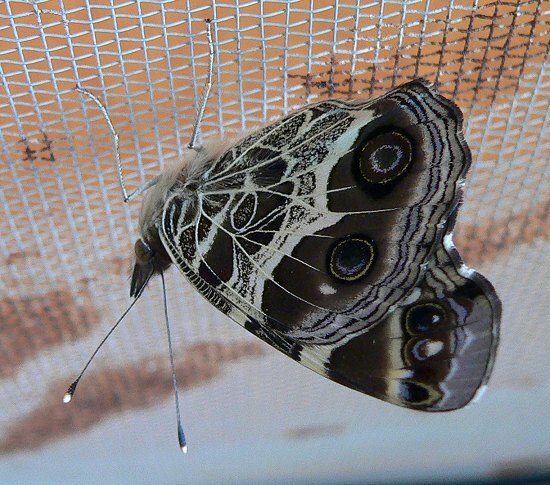 This is the butterfly just after it emerged from its chrysalis. And here it is sitting on the driveway for a moment after it was released. I’ve been feeding my moth caterpillars, and when I was changing the oak leaves in the Polyphemus cages I found another caterpillar on the oak. 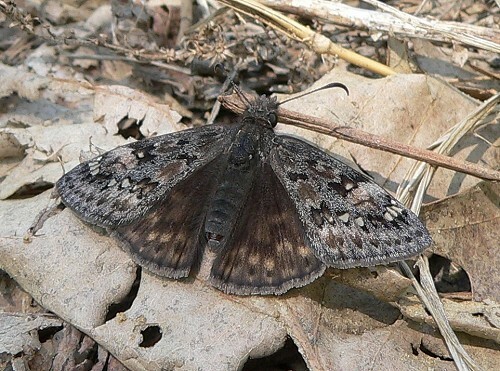 I think it’s a skipper – possibly a Juvenal’s Duskywing – but I’ll have to wait until it hatches to be sure. When it’s this hot – 90 degrees for the past few days and no rain for weeks – I do my outside work in the morning, and spend the hot part of the day inside – doing things like blog entries. Then we walk in the late afternoon, and I often take another walk as it’s getting dark. I love walking at dusk and coming home in the dark. 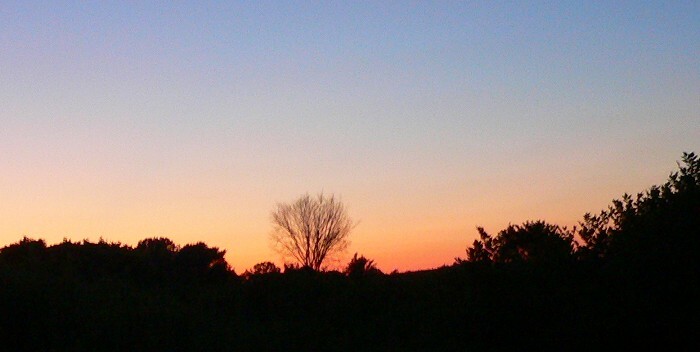 I hear the late birds chirping at dusk – the swallows, and the Wood Pewees. Tree Frogs are still calling along the creek, in spite of the drought. There aren’t as many fireflies in the prairies now, but there are still plenty in the woods. Then the bats come out, and sometimes I hear night birds calling. A few nights ago I heard a Whip-poor-will – only the second time I’ve heard one here. And last night I heard a mysterious breathy howl that sounded a little like an owl. I haven’t figured out what that one was. I often hear coyotes, and sometimes see them slinking away from me across the fields. Deer snort and bound away into the woods as I walk by.